Last year, blogger Lauren Aloise came to TBEX Girona – and when the representatives from Toronto got onstage during the closing session to introduce their city as the host of the next conference, they announced that the winner of a trip to attend TBEX Toronto was Lauren. Attending two TBEX events in a row gave her a chance to think about how she would do things differently this time. Upon hearing that TBEX Europe would be in Girona last year, I was thrilled. It seemed like things were falling into place as I took a big leap by quitting my job as an ESL teacher to focus my energy on making my blog a business. Something that had once seemed scary – impossible even – was suddenly a reality, and to make things even better TBEX was set to take place not too far from Madrid, my home base. I bought a ticket without hesitation, and started making plans for which sessions I’d attend. I even played around a bit with the speed dating appointment system, accepting a few appointments from people and checking out who I might want to talk to. Sure, it’s fun to see a place with few expectations and an outsider’s perspective. But I quickly realized that doing a bit of prior research can make all the difference in producing a good story. With so many bloggers exploring the same place, one of the key ways to produce unique content – not just the cookie cutter stuff we often see – is to have questions ready for the places and people we will encounter. Last year I didn’t really have a mission at the conference. Sure, I wanted to network, to learn from the sessions, and to experience a fantastic place – but I hadn’t defined any specific achievable goals. This year I am going a different route, and making some very specific goals for myself and my business. From meeting a specific person, to asking specific questions, I know what I want this time around! I am a Spain based blogger who writes about Spanish cuisine, Spain travel, and short European escapes. As much as other areas of the world may tempt me, I know that I am unable to experience them at the moment, and also that they don’t fit my current demographic. Last year I felt pressured to make as many contacts as possible – go, go, go! And while I agree that a contact can be valuable no matter what, I will definitely be focusing on quality over quantity this year, setting up fewer meetings with more defined and realistic goals. I was so worried about missing something important last year, that I barely gave myself bathroom breaks. And while every session and meeting is valuable, learning to balance what you personally require as far as downtime goes is equally important. This year I plan to take a break when necessary, and if it means not getting everything in, I accept that I’m not Superblogger. On the other side of the equation is nightlife and socialising. In Girona I quickly realized that blogging conferences can be extremely social events, with some of my fellow bloggers staying out into the wee hours of the night. With the last point in mind, I didn’t partake – I wanted to get as much sleep as possible to keep moving the next day. So while it’s not to say that this year I’ll be in party mode, I certainly hope to socialize a bit more than last time. Attending TBEX Girona motivated me to keep doing what I love. I was able to meet so many hardworking, positive, and motivational people, and their go-getter outlook helped me return to Madrid ready to work hard for what I love doing. This year I am going to take on Toronto with a slightly different game plan, but with the same passion and motivation that had me turn down this path in the first place. I look forward to meeting all you likeminded people there. About the author: Originally from small-town Massachusetts, Lauren Aloise always planned on trading cold, rural winters for the buzz of a big city. 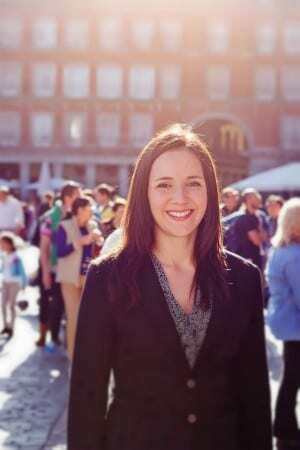 Currently going on her fourth overseas, she lives happily in busy Madrid where she runs Madrid Food Tour and writes about European travel and expat life at Spanish Sabores. She appreciates fantastic cuisine and the high quality ingredients found in any Spanish kitchen, and when not writing is surely out for a tapa and a glass of Spanish wine. Thanks so much for sharing these thoughts Lauren! As a first-time TBEXer this year, it’s helpful to read where you were last year and how your focus has shifted this year. I’d love to read a follow-up post to see how your experience here in Toronto goes!